Please join us to see our training facility, meet our dogs, find out more about our training process, and learn more about where we’re going in the next year. 2018 Open Houses are on February 6th, June 5th, and October 15th from 5-7 pm. Walk around our training facility and office, and learn why we’ve set our training area up like a home. See how we use our magnetic wall to teach the dogs to turn on lights. Meet our staff, board, volunteers and dogs, and get your questions answered. 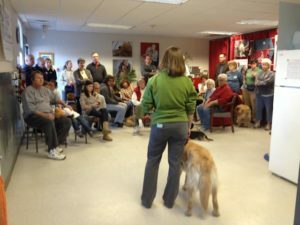 Learn about how we train our dogs and how we match them with clients. We’ll have information about a variety of ways you can get involved. We’d love to talk to you about your interest in EENP. Please spread the word and bring a friend who might be interested in EENP! The entire family is welcome, but please no pet dogs, as our dogs will be working. Give us a call or email if you have any questions. We look forward to seeing you here.